Kurtley Beale is a hugely talented back who can turn a match in the blink of an eye but his recent history has been tarnished by off-field incidents which have threatened to derail his career. He was earmarked as a future Wallaby from an early age and success at schoolboy level was followed by a Super Rugby debut in 2007 at the age of just 18. 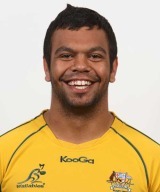 Beale alternated between fly-half and inside centre for the Waratahs, but eventually settled at fullback. He was selected for Australia's 2009 tour as back-up and impressed enough in tour fixtures to win a debut Test cap off the bench against Wales. He earned his first Test start against Fiji the following year before appearing off the bench against England and Ireland but his push for a Tri-Nations role was hampered by assault charges - that he was cleared of - and a A$5,000 fine for urinating outside a nightclub following the victory over the Irish. He struck a rich vein of form in the 2010 Tri-Nations and began the 2011 Super Rugby season at fullback but also returned to fly-half as cover and went on to play an integral part in the Wallabies side that finished third at the 2011 Rugby World Cup. In a surprise move, he switched south to the Melbourne Rebels in 2012 but injuries limted his contribution in his first Super Rugby campaign. He again made headlines for the wrong reasons later that year when he was charged with common assault but he remained at the heart of Australia's plans. He filled the Wallabies' No.10 shirt for the latter part of the Rugby Championship and the end of year tour of Europe - most notably notching a 14-point haul and a last-gasp try to beat Wales in Cardiff. But his dark side again won out when he was involved in a fight with Rebels team-mates after a game in Durban and he agreed with the ARU a self-imposed indefinite absence while he tried to get himself sorted.